It's tough when something you love gets stained or tarnished, like that first pair of all-white Jordans, or Jordan. For lasting gear that won't come on to your wife and gamble away all your money, check out Ragged Edge. Just now turning their gaze towards new-fangled macbook/ipad/iphone sheethings, Floyd, VA-based mother/daughter duo Ragged was originally inspired by their need for a durable, waterproof/smellproof place to stow their post-sailing clothes, and now churn out super rugged, tactical-looking bags from materials like Aramid, Carbon fiber, Pentex, PET-X, and even Kevlar, for the messenger who's just not taking any chances with his message. 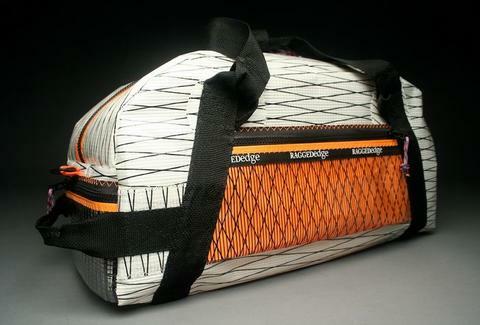 Everything's reinforced on all of the stress points with sailmaker layering techniques and triple-step zig zag stitching, with larger unbreakables including the orange/white Airstream (a three-pound duffle with 3 gusseted zippered pockets/lockable double-zip main opening), the dark metallic Carbon Fiber Messenger Bag with a padded grab handle/double velcro quick closure, and the lightweight, black Carbon Fiber Briefcase, with an angled stripe pattern and corrosion-resistant "marine grade zippers", though not Marino grade zippers, cause that'd get them sued by Isotoners. Smaller accessories include a black Kevlar Aramid wallet with a clear vinyl ID sleeve (that stays clear/doesn't crack), a black/royal blue Carbon Fiber Toiletry bag with an inside sleeve pocket/"easy grab" strap, and a silver grey/teal document folder made from a waterproof Pentex sailcloth that has "minimal flex loss", meaning it'll go perfectly with your bulging Traps-er Keeper. For the next week, they're hooking up Thrillist subscribers with a 15% discount when they drop $100, or what MJ would describe as his winningest night ever!